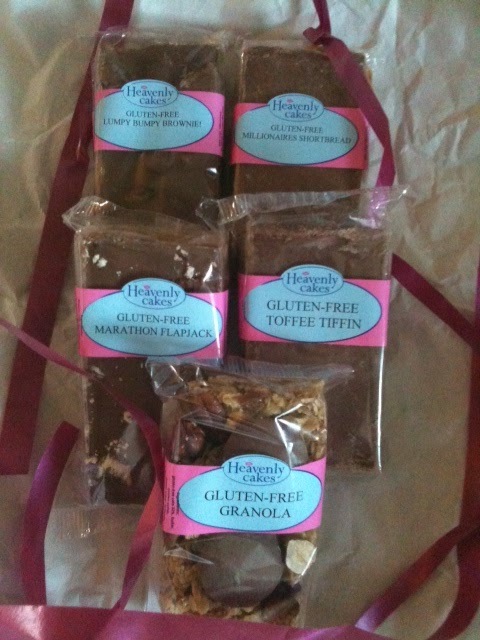 The lovely people at Heavenly Cakes sent me over some Gluten Free cakes for us to try. My hubby is on a Gluten Free diet and trying to find some decent treats for him proved to be difficult. So I jumped at their offer. We were sent Gluten Free Granola, Gluten Free Marathon Flapjack, Gluten Free Toffee Tiffin, Gluten Free Lumpy Bumpy Brownie and Gluten Free Millionaire’s Shortbread. All little wrapped packets of yummyness. On looks alone these cakes would have anyone drooling. He ate the Granola one first as he wasn’t sure what Granola was and didn’t think he’d like it. Surprise Surprise he loved it. I got a small piece to try and having tasted other Gluten free cakes I wasn’t too sure but I have to say this was yummy and I couldn’t have told the difference. The Marathon Flapjack was rich and sticky and divine. You could feel your teeth dissolve while you were still eating it. Truly Heaven. However, I only got a small corner. Hubby thought his favourite would be Millionaire’s Shortbread. It was nice but certainly not his favourite. His favourite was Gluten Free Toffee Tiffin Bar. Mine of course was the lumpy bumpy Brownie, with a name like that, it was bound to be delicious and it was. I was very surprised by these cakes, you could not tell they were Gluten Free, they are nothing like the store bought ones. These are ones you would get in a top class bakery. I have a very sweet tooth and I loved these. Hubby did too and we will definitely be buying from Heavenly Cakes in the very near future. The costs I think are very good for these little pieces of heaven, on the website you have a choice of gift pack (6 generous portions – £6.50), family pack (12 large portions – £14) or bars pack (6 individually wrapped bars – £8.40). I don’t know about you, but I want to order them all. I would recommend Heavenly Cakes to everyone, their cakes are little treats from Heaven. Disclaimer:- I was sent these Gluten Free cakes in exchange for an honest review which I have given.